“The Shape of Water” (2017). Cast: Sally Hawkins, Michael Shannon, Octavia Spencer, Richard Jenkins, Michael Stuhlbarg, Doug Jones, Nick Searcy, Stewart Arnott, Nigel Bennett, Lauren Lee Smith, Martin Roach, Allegra Fulton, John Kapelos, Morgan Kelly, Marvin Kaye, Wendy Lyon. Director: Guillermo del Toro. Screenplay: Guillermo del Toro and Vanessa Taylor. Story: Guillermo del Toro. Web site. Trailer. 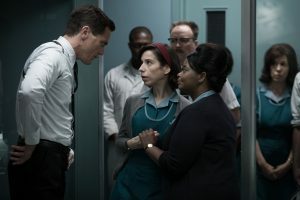 As a custodial worker in a secret government marine laboratory in Baltimore in 1962, Elisa Esposito (Sally Hawkins) quietly goes about her job, performing her everyday chores and trading quips with her colorful, sassy co-worker, Zelda (Octavia Spencer). The banter tends to be somewhat one-sided, though, given that Elisa is mute, but she nonetheless never seems to have any trouble making her feelings known, especially when it comes to dealings with the facility’s intimidating new security chief, Richard Strickland (Michael Shannon). Despite the relative calm that has long prevailed at the lab, things change dramatically with the arrival of a mysterious new specimen, an amphibian being that looks like a cross between a man and a reptile (Doug Jones). Having been taken from its home in the Amazon, the creature has been brought to the facility for further study under the auspices of scientist Dr. Robert Hostetler (Michael Stuhlbarg). But the new arrival is more than just a scientific curiosity; it’s believed that the aquatic enigma may possess special abilities, some that might even be weaponized (hence the beefed-up security). These potentially significant, highly coveted qualities are much sought after by American military officials, especially now that the country is caught up in the Cold War with the Soviet Union, a threat that’s perceived as lurking everywhere – even in the lab. When Elisa and Zelda are assigned to work in the area where the creature is housed, they get quite an astonishing eyeful. Not only do they catch a glimpse of the strange new being, but they also witness the unduly cruel treatment to which it’s summarily subjected, behavior that elicits a comparably brutal response from the creature. Elisa is appalled at what she sees and instantly takes pity on the wounded victim. So, when no one is around, she quietly sneaks into the lab to show the new visitor that there’s more to being human than inflicting harm on others. By exhibiting kindness and compassion, she conveys a very different impression of humanity, and the creature responds in kind. An unusual bond is forged, one that grows into an unconventional friendship – and more. Intimidating security chief Richard Strickland (Michael Shannon, left) questions custodial workers Elisa Esposito (Sally Hawkins, center) and Zelda Fuller (Octavia Spencer, right) about their work routine in a secret government marine lab in director Guillermo del Toro’s new romantic fantasy, “The Shape of Water.” Photo by Kerry Hayes, courtesy of Fox Searchlight Pictures. However, with various factions vying for control of “the asset,” as the creature is often called, its fate is soon up for grabs. And so, with such perilous uncertainty looming, Elisa decides to take action to protect her new friend. With the aid of her somewhat neurotic neighbor, Giles (Richard Jenkins), and a few unexpected allies, Elisa undertakes a risky plan to shepherd the defenseless being out of harm’s way, an initiative that holds the promise to pay more dividends than she ever could have imagined. But will her efforts pan out? The unusual relationship that develops between Elisa and her Amazonian companion may defy convention, but who’s to say that such an arrangement can’t work, that it’s inherently outside the realm of possibility? Those who push past traditional barriers and challenge the prevailing wisdom might find that the uncharted territory that such involvements occupy is richly rewarding, even if it’s something others would never consider. 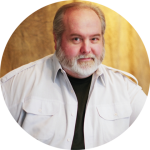 After all, when the heart is involved, there’s no telling what might arise, and the outcome may prove to be quite revelatory, both in terms of what works for us – and the lengths we’ll go to in protecting it. Of course, such connections are possible only if properly supported by beliefs that make them happen, a cornerstone principle of the conscious creation process, the philosophy that maintains we manifest the reality we experience through the power of our thoughts, beliefs and intents. And, in the case of Elisa and her unlikely consort, those metaphysical building blocks are obviously in place to make their bond possible. In forging this relationship, however, the participants obviously must push past conventional limitations and beliefs that would otherwise hold them back. But they apparently understand this and are unconcerned about the potential influence of any impediments that might impinge upon their success. That’s one of conscious creation’s chief aims – one we’d be wise to aspire to – and Elisa and her beau set an inspiring example to follow. However, if Ms. Esposito and her companion are so taken with the idea of making their association work, one might wonder why they’ve also created so much ancillary strife in their lives. Why burden themselves with such seemingly unnecessary complications? 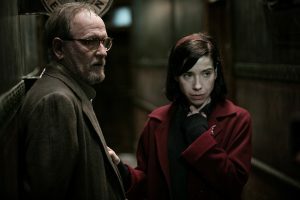 When a defenseless laboratory creature is threatened, custodial worker Elisa Esposito (Sally Hawkins, right), along with her neighbor, Giles (Richard Jenkins, left), concocts a plan to protect it in the inventive new fantasy/fairy tale, “The Shape of Water.” Photo by Kerry Hayes, courtesy of Fox Searchlight Pictures. Despite the hardships posed by such challenges, conundrums like those they experience can also serve as a galvanizing force. By putting their bond to the test, the would-be lovers provide themselves an opportunity to determine the viability of their connection, to see if it can withstand the pressures put upon them that could tear them apart. Under circumstances like these, aspiring mates can evaluate just how committed they are to one another and to their proposed undertaking. Such an exercise can be quite revelatory, exposing weaknesses and spotlighting strengths that could potentially remain hidden but that might ultimately prove invaluable to the success of the venture. These are principles that are transferable to virtually any type of conscious creation initiative, whether undertaken individually or in tandem.  They’re equally applicable in creative pursuits, business ventures, vocational undertakings or conceivably any other course of conduct we consider engaging in. This, in turn, opens up an array of new possibilities, many of which may not otherwise garner any consideration or attention. But then that’s what the miracle of conscious creation makes possible. Though at times a little predictable, “The Shape of Water” delivers the goods on so many fronts. 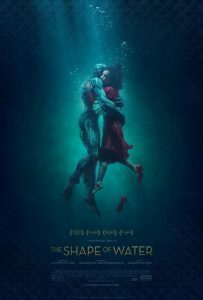 Director Guillermo del Toro’s fantasy romance serves up an utterly charming tale with superb special effects, gentle humor, heartwarming sincerity, and a host of excellent performances, especially by Hawkins, Spencer and Jenkins. Think “Beauty and the Beast” (1991, 2017) meets “E.T. the Extra-Terrestrial” (1982), and you’ve got a good idea what’s going on here. It’s truly satisfying to see a film that genuinely lives up to its pre-release hype. “The Shape of Water” is also a celebration of the underdog. The most likable – and happiest – characters in the film are those who live their lives outside the mainstream, including characters who are disabled, gay, minorities and even alternate species, all of whom experience ridicule, criticism, harm and ostracism just for being different (and to a much harsher degree than they would typically experience today). This theme is also reflected through upbeat TV and movie clips featuring such famous nonconformists as Carmen Miranda, Mr. Bojangles, Maynard G. Krebs and Mr. Ed. These characters all relish their individuality – and very much in stark contrast to those in the mainstream majority, whose snarly attitudes toward those who are different reveal their inherent insecurities and how threatened they feel by those who aren’t afraid to shed conventional limitations and celebrate their uniqueness. 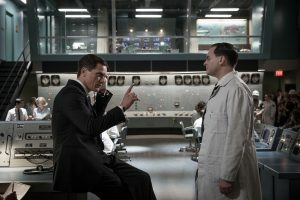 Intimidating security chief Richard Strickland (Michael Shannon, left) often finds himself at odds with marine scientist Dr. Robert Hofstetler (Michael Stuhlbarg, right) in “The Shape of Water.” Photo by Kerry Hayes, courtesy of Fox Searchlight Pictures. The film is attracting considerable awards season buzz, having snagged 14 Critics Choice Award nominations, including best picture, actress (Hawkins), supporting actor (Jenkins), supporting actress (Spencer), director and screenplay, along with an array of technical awards. In addition, the picture earned seven Golden Globe Award nods, including best dramatic picture, dramatic actress (Hawkins), supporting actor (Jenkins), supporting actress (Spencer), director and screenplay. 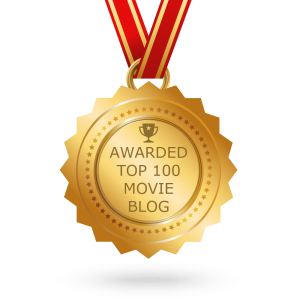 It was also named one of the American Film Institute’s Top 10 films of the year. With a response like this, other accolades are sure to follow. Even when we believe we know what love is, we can’t really know until we find ourselves wrapped up in it, ensconced in the rapture of emotion that washes over and thoroughly envelops us. It’s an undeniable feeling, one that we never want to let go of, even when that seems destined to occur. But, when faced with such circumstances, something just might come along to sustain it, making it possible to truly live happily ever after.